If I were asked to name my least favorite breakfast food to make I would, without hesitation, answer “waffles.” It’s quite sad, really. I love the waffle. I love the crunchy exterior and the fluffy soft inside. I like the nooks and crannies that serve as little buckets of goodness that deliver the perfect amount of syrupy deliciousness to your mouth with each bite. Unfortunately, waffles also happen to be traditionally made with dairy and smothered in butter, which makes them verboten on most breakfast menus for a vegan. Most vegans simply compensate for this by whipping up their own bundles of waffle love in their home kitchens. I, however, have been challenged by the waffle. Something always seems to go awry with my waffle attempts – they end up undercooked, overcooked, burned, in pieces, stuck to the waffle iron, bland, tasting like baking powder, or just plain ugly and tasteless. This morning Dan and I were discussing what to make for breakfast when he offered to make us some pancakes. The silence he was met with conveyed my thoughts, to which he responded, “No, really – I can do this. Just give me a recipe. It’s like a chemistry experiment.” Well, then – “Let’s do this together,” I say, followed by, shockingly, “But instead of pancakes, let’s make waffles!” Perhaps it was the comforting assurance of back up that led to my crazy talk. No matter, waffles it was … it was our mission. 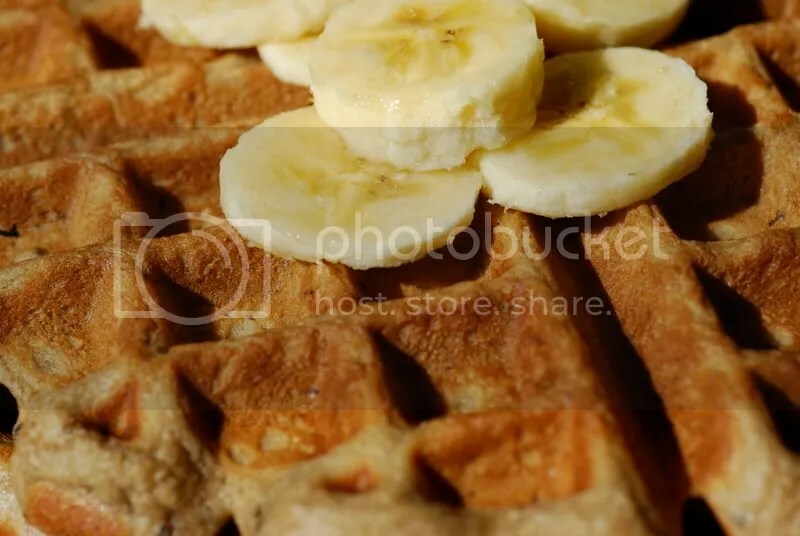 We took stock of our fruit – apples, bananas, mangoes, and blueberries – and decided upon a peanut butter banana waffle, with just a touch of carob for a hint of chocolate undertone. 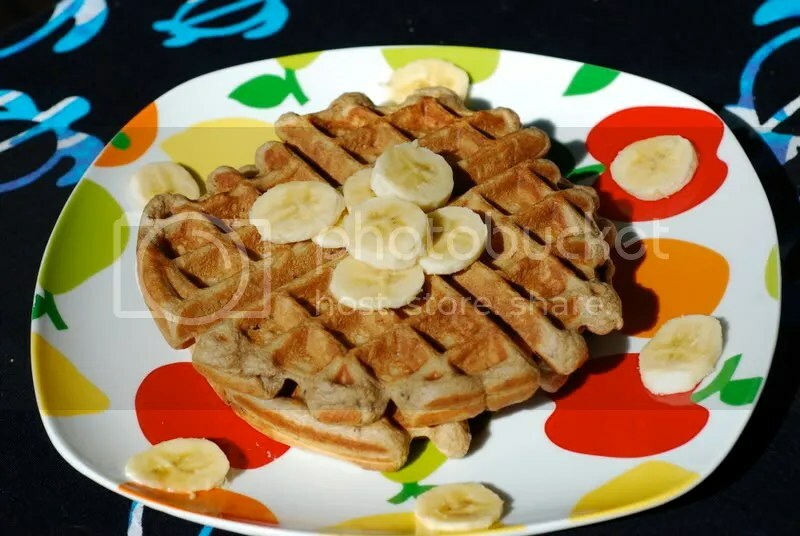 Dan also insisted that no matter what kind of waffle we made we would have to incorporate Tofutti cream cheese, which I though would pair well with the peanut butter to create a rich, creamy, smooth tasting waffle. I am happy to say that these waffles were the most perfect waffles I have ever been a part of making! I opened the waffle iron upon the first waffle with trepidation, expected to see the usual mess – but instead I was treated to the sight of a perfectly browned, fluffly waffle. This recipe turned out four big, beautiful waffles that all tasted delicious. Already we are planing another batch that will be a dessert waffle, topped with some vanilla soy ice cream. 1. Preheat your waffle iron per the manufacturer’s instructions. 2. Sift dry ingredients together into a medium bowl. 3. In a seperate bowl, combine the mashed banana, peanut butter, and cream cheese and mix. Add the oil and vanilla and mix until incorporated, then mix in the soymilk until well combined. 4. Slowly add the dry ingredients to the wet ingredients and mix until well combined. Your batter will be thick. 5. Lightly spray both the top and bottom waffle griddle and add 2/3rds cup of batter to the waffle iron, spreading out the batter slightly before closing the iron. Our waffles took about 4 minutes to cook up into perfect waffles, but be sure to check your manufacturer’s instructions for times. Repeat for each waffle, taking care to spary the iron with oil between each waffle so as to prevent sticking. Keep dine waffles warm by covering them with foil. 6. Serve with sliced bananas and warmed maple syrup. Update: These waffles kept us going all day! 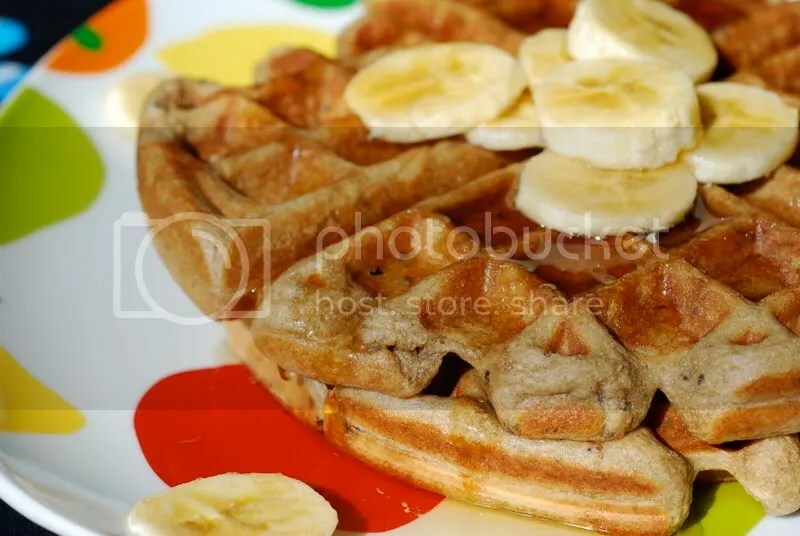 PB + nanner waffles = power food. Who knew? I’m with you in the waffles department. I love them when they are done right, but it’s so hard to get them right! Yours look delicious (way to go, trooper Dan!)! Not to be a party pooper, but how to de-veganize these? As much as I’d love to make these as is, there is no way I’m finding Tofutti cream cheese over here (heck, I can barely find peanut butter). What is the equivalent (or is there one)? Cream cheese? Butter? That’s awesome, Jennifer! I’m so glad that you gave the recipe a go! My answer to your question, had I gotten to it in time, would have been to substitute the same amount of the equivalent non-vegan product. In fact, that applies to all of my recipes, for future reference. I great non-vegan option for the tofutti cream cheese is neufchatel cheese. It’s delicious and has a very similar consistency. going to try but i prefer self-rising flour for my budget…same amount minus the baking soda and powder?